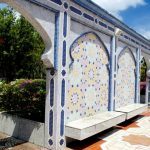 I’d always wanted to visit The Sultanate of Brunei but somehow it had never happened – until circumstances brought me to the Brunei capital Bendar Seri Begawan on a great value Royal Brunei Airlines flight from Bangkok to London ‘via’ Brunei. Of course it’s hardly on the way, in fact it’s just over two hours in the wrong direction, but I wasn’t going to argue with a free day trip to Brunei and a unique chance to explore this fascinating nation. The transit tours are provided by Sunshine Tours Borneo, and SavoirThere just rocked up at the desk on arrival like any other customer and arranged and paid for her day tour on the spot – and they couldn’t have been nicer to deal with. When they saw how many notes she was taking and what a genuinely nosey journo type she was they kindly invited her on the evening tour as their guest.